This blog post was co-authored by Ron Matchoro, Principal Program Manager, Ronit Reger, Senior Program Manager, Miri Landau, Senior Program Manager, and Devendra Tiwari, Principal PM Manager, Azure Security Center. Advanced Threat Protection for Azure Storage helps customers detect and respond to potential threats on their storage account as they occur. This layer of protection allows you to protect and address concerns without needing to be an expert in security. Enabling it is quick and simple. Once enabled, security alerts are triggered when suspicious activity occurs and you can view them listed in Azure Security Center. Security alerts provide details of suspicious activity that was detected and recommended actions to take to investigate and mitigate the potential threat. Easy enablement for many storage accounts using the Azure portal, Azure Policy, or Standard Azure APIs. To learn more, refer to the documentation, “Advanced Threat Protection for Azure Storage,” or the Azure Security Center pricing page. 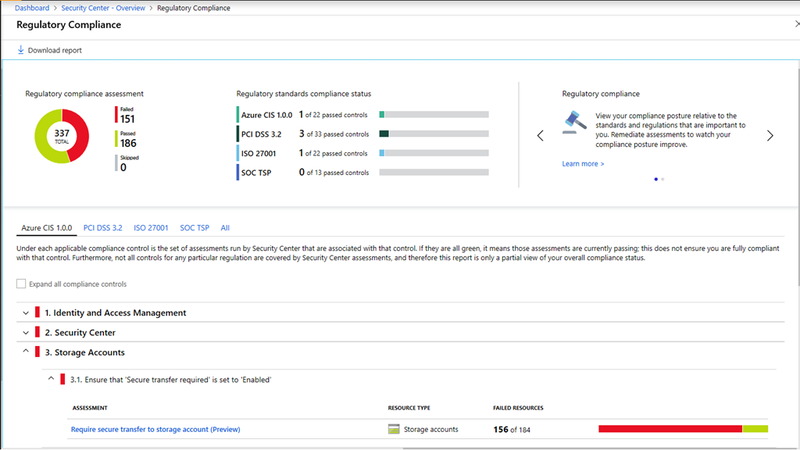 We are pleased to announce that the regulatory compliance dashboard in Azure Security Center is now generally available! The dashboard helps Security Center customers streamline their compliance process by providing insight into their compliance posture for a set of supported standards and regulations. The compliance dashboard surfaces security assessments and recommendations as they align to specific compliance requirements based on continuous assessments of your Azure and hybrid environments. The dashboard also provides actionable information for how to act on recommendations and reduce risk factors in your environment, and thus improve your overall compliance posture. The information provided by the regulatory compliance dashboard can be very useful for providing evidence to internal and external auditors on your compliance status with the supported standards. To further facilitate this, you can now generate and download a compliance report directly from the compliance dashboard. The report can be generated for a particular supported compliance standard and depicts a high-level summary of your current compliance status with respect to that standard. In addition, you can now automate compliance processes and manage them at scale using programmatic APIs. Security Center can now protect your Virtual Machine Scale Sets. You can easily monitor the security posture of your VM Scale Sets with security recommendations to increase overall security, reduce vulnerabilities, and detect threats with Security Center’s advanced threat detection capabilities. Security Center automatically discovers your VM Scales Sets and recommends that you install the monitoring agent to get better security assessments and enable events-based threat detection. Threat detection alerts are also available for VM scale sets instances for any VM protected by Security Center standard tier. To learn more on VM Scale Set support. Note: Pricing of VM scale sets instances is the same as VM. For detailed information visit our pricing page. The Azure Dedicated Hardware Security Module (HSM) service provides cryptographic key storage in Azure and meets the most stringent customer security and compliance requirements. This service is the ideal solution for customers requiring FIPS 140-2 Level 3 validated devices and complete, exclusive control of the HSM appliance. 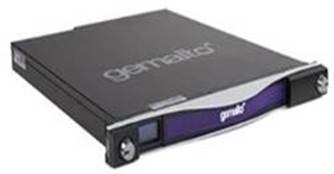 The Dedicated HSM service uses SafeNet Luna Network HSM 7 devices from Gemalto. This device offers the highest levels of performance and cryptographic integration options and makes it simple for you to migrate HSM-protected applications to Azure. The Azure Dedicated HSM is leased on a single-tenant basis. The Azure Dedicated HSM service was originally announced in 8 Azure public regions on November 28, 2018 and we are now pleased to announce that the service is expanded to the UK, Canada, and Australia. With this new announcement, the Dedicated HSM service is now available in 14 regions namely, East US, West US, South Central US, East US 2, Southeast Asia, East Asia, West Europe, North Europe, UK South, UK West, Canada Central, Canada East, Australia East, and Australia Southwest regions. We plan to continue expanding this service to other Azure regions. To learn about pricing and suitability of this service for your applications, please contact your Microsoft Account representative. Today, we are excited to announce the general availability of Azure Disk Encryption (ADE) for Virtual Machine Scale Sets (VMSS). With this announcement, Azure disk encryption can be enabled for Windows and Linux Virtual Machine Scale Sets in Azure public regions. This enables customers to help protect and safeguard the Virtual Machine Scale Sets data at rest using industry standard encryption technology. Azure Disk Encryption is a capability that helps you encrypt your Windows and Linux IaaS Virtual Machine Scale Sets disks. Disk Encryption leverages the industry standard BitLocker feature of Windows and the DM-Crypt feature of Linux to provide volume encryption of disks. The solution is integrated with Azure Key Vault to help you control and manage the disk-encryption keys and secrets. The solution also ensures that all data on the VM disks are encrypted at rest in your Azure Storage. The solution is deployed in all Azure public regions. Additional details on supported and unsupported scenarios, interfaces, and how you can use the disk encryption technology to encrypt your Virtual Machine Scale Sets and validate your scenarios is documented below. Virtual Machine Scale Sets encryption is supported only for scale sets created with managed disks, and not supported for native (or unmanaged) disk scale sets. Virtual Machine Scale Sets encryption is supported for OS and Data volumes for Windows Virtual Machine Scale Sets. Disable encryption is supported for OS and data volumes for Windows Virtual Machine Scale Sets. Virtual Machine Scale Sets encryption is supported for data volume for Linux Virtual Machine Scale Sets. Disable encryption is supported for data volumes for Linux Virtual Machine Scale Sets. Virtual Machine Scale Sets reimage and upgrade operations are supported. The key vault to safeguard the encryption must be provisioned with the right access policies in the same subscription and same region as the Virtual Machine Scale Sets. Virtual Machine Scale Sets encryption is not supported for scale sets created with native (or unmanaged) disk. Virtual Machine Scale Sets encryption is not supported for OS volume for Linux Virtual Machine Scale Sets encryption. Our continued investments in Azure security can help you reduce costs and complexity with a highly secure cloud foundation managed by Microsoft. Use multi-layered, built-in security controls, and unique threat intelligence from Azure to help identify and protect against rapidly evolving threats. To learn more about Azure Security please visit Azure Security homepage. To try Azure Security Center’s new capabilities, please visit the Azure Security Center homepage. As always, for any feedback or additional information contact our team at SecurityCenter@microsoft.com.